The Basics: What Is A Drone? ​A drone is an aerial vehicle that operates without a pilot inside of it. These devices are navigated with a control that functions through GPS tracking. Often, drones are equipped with cameras that enable picture of video recording of the aerial view. Although drones were originally created and sold to industrial and professional clientele, drones have grown in popularity among casual, hobbyist users. With this increase in demand and increased diversity in user needs, new drones are being released to the market with different features. When people thing of drones, they often thing of quadcopters. These are a class of drones that have four main rotors and are always controlled by remote controls. Drones—or unmanned aerial vehicles—refer to a more general class of technologies. Although drones have been around for decades, their commercial and industrial applications have expanded in recent years. As technologies progress, drones become more accessible and usable to a greater pool of people. With rates of drone use expected to increase by nearly 200 percent in the next few years, it is important to consider the current technologies and where they fit into the larger landscape of drone innovations. Keep reading to learn about the brand DJI and its inventive Mavic Pro in this review and check out our monster review of all the best drones. The DJI Mavic Pro Drone weighs 743g and measures 83 x 83 x 198mm. It has 4K camera resolution, 24 high-performance computing cores, 4.3 mile or 7-kilometer transmission range, 40 miles per hour speed, stable 3-axis gimbal, 80W rapid charger, and foldable design. All of these features can be controlled manually. The DJI Mavic Pro is actually a type of quadcopter, meaning it has 4 rotors. This is a balanced medium between lower types like the tricopters and the high types like the octocopters. The most popular type of multi-rotor drone, the DJI Mavic Pro is built for a wide audience of consumers. The DJI Mavic Pro has “eye in the sky” technologies, making it ideal for photography, film, and surveillance and workable by hobbyists and professionals alike. These features make the DJI Mavic Pro a relatively small drone that packs the power of larger models. Donning the notable portability and convenience of high-class models, this drone is maneuverable so that users can get the perfect footage. Regardless of what new technologies have come and will continue to come in the next few years, the Mavic Pro sets itself apart as an incredibly light weight, compact, portable device. It was a cutting-edge product of its time for this asset, and it continues to standout in the market. For the extensive technologies it contains—such as the quadcopter design, controller, and charger, —the whole system takes up relatively little space. This aspect makes the Mavic Pro a great option for those who travel, those with limited storage space, those who carry drones all day, those who work alone, those who cannot carry heavy or bulky items, those who use drones in hard to access locations, and those who simply refuse to fuss around with the inconvenience of large drones. The biggest disadvantage of most small drones is their lack of image quality, often caused by tumultuous stability while in air. However, with all of its durability and steadiness features built in to the Mavic Pro, these design susceptibilities are combated. For example, tough plastic and a clear plastic carrying cage protects the device when in air and on ground. A small but mighty camera boasts a 1 / 2.3-inch sensory that takes 12MP still photographs in a variety of formats, including DNG RAW and JPEG, and video resolutions and frame rates of either 4K at 30fps or 1080p at up to 96 fps. Between the motorized gimbal and the drone’s many sensors, users of the Mavic Pro can make miniscule, instant adjustments to the drone’s positioning. Another tool the Mavic Pro has to aid in stability and durability are four additional cameras. An unconventional solution, these cameras are not about photography and videography; instead, they prevent drifting, converse with GPS and other positioning signals, and detects obstacles in the drone’s front-facing trajectory. Another inventive asset of the original Mavic Pro is its control mechanics. Like the drone, it is a space-saving, foldable device. Compatible with both Apple and Android smartphones, all users have to do is plug the controller into the phone, and the controller automatically synchs the three devices using Wi-Fi or RC. By working in tandem with a phone, the Mavic Pro was one of the first models that offered users the ability to view the live feed of a drone. The app plays an impeccable 1080p quality. This enables users to make smart adjustments immediately in a relatively intuitive way. Keep in mind that this works for a distance of around 4.5mi. In many places, administering a drone past one’s line of vision is illegal, so the range of the Mavic Pro is more than enough for most uses. The bottom line is that the Mavic Pro offers a combination of user-friendly portability without sacrificing stunning technological features that gadget-lovers, hobbyists, and professionals crave. What can a larger model do that the condensed Mavic Pro cannot do? Not much. Some speed is sacrificed as well as some removability mechanics. However, the advantages far outweigh the disadvantages for most potential buyers. Technologically savvy people know the value of accessories in terms of diversifying a product’s uses and capabilities. The great news about the DJI Mavic Pro is that it is an excellent stand-alone device. With the basic bag ensemble of tech gear that comes with the model—such as a battery, cord, and protective gear, —users will be good to go. However, DJI also has a slew of convenient and curious items designed to enhance the usability and creativity of those who drone. 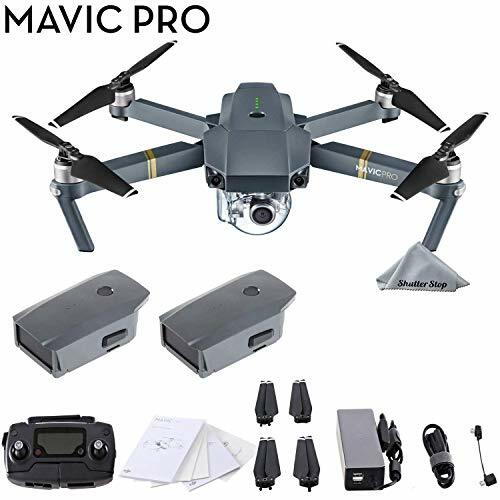 The Mavic Pro Car Charger, Mavic Remote Controller Monitor Hood, PGYTECH Drone Landing Pad, PGYTECH Smartphone Screen Hood for Remote, MAVIC Remote Controller Tablet Holder, travel bags, connector cables, memory cards, and cleaning its are some of the many accessory options. For professional users who need to maximize usage, the accessory lineup will meet needs, such as car chargers and additional memory cards. For hobbyists who enjoy collecting items, gadgets, and accessories, some items are cool and convenient to have on hand, such as landing pads. The most recommended accessory by DJI Mavic Pro users are holders for tablets and smartphones. It can be tricky to juggle the remote, cord, and phone or tablet while trying to make modifications to the drone’s flight path and visual intake. So, devices built to assist in holding these components will increase usability and make for an altogether more enjoyable, manageable droning experience. Who Is the DJI Mavic Pro Made For? Of the main categories and purposes of drones, the DJI Mavic Pro comfortably meets most of them, which means it is appealing to many users. Although it is not designed for races, tricks, delivers, or helicopters, it is good for photography/videography, global positioning systems (GPS), tracking, and vertical takeoff and landings (VTOL). Those who are fascinated by drone footage but leery of large, difficult to maneuver models will find DJI’s Mavic Pro to be an approachable, accessible, intuitive drone. This makes it a great starting point for hobbyists and casual users among others. That being said, the Mavic Pro appeals to more than first-time drone operators. Aerial photographers, video aerial inspectors, conservation workers, search and rescue teams, energy infrastructure developers, and leisure users among others will find the DJI Mavic Pro to be a fantastic choice for their needs. Those in the fields of agriculture, construction, and security will find it meets or even exceeds their needs in a drone. With the market for drones predicted to increase nearly 200 percent in the next few years, these types of drones that meet the wants and needs of a most demographics are in high demand. This is where DJI Mavic Pro excels, straddling the line between professional and personal, commercial and industrial, portable and powerful, and user-friendly and high-tech. Despite its design’s appeal to a relatively broad audience, there are some people and organizations whose needs will not be met by the DJI Mavic Pro. For instance, those in need of large drones—typically the size of a small aircraft—will find this model to be insubstantial. Those who require the drone for military purposes or intensive surveillance should look elsewhere. Similarly, those who seek nano drones—typically the size of an insect—will find this model unworkable. It is too large to fit indoors and too obtrusive for micro tracking. Another aspect to consider is endurance and range, which go hand in hand. Whether a drone is close-range, short-range, or mid-range determines how many miles away a controller can be and for how long the device can stay in the air. With an average of a 30-minute flight time, the DJI Mavic Pro straggles the high end of the close-range into the low end of the short-range. This means that for super intensive uses or project, this drone is not a good choice. But, for most consumer needs and many professional needs in urban, suburban, and remote areas, this is a great option. For those who favor using drones in low-light conditions, the Mavic Pro may not pass the test. Because the camera is so small, dim light hinders the capture of things like detail, color, contrast, and crispness. Night-time users will have the most difficulty with this model, but users who prefer daylight will be impressed by the camera quality. DJI is a forward-thinking brand focused on capturing hard to reach images. They create their drones with creative purposes in mind. Known for flying cameras with smart placements, stabilization systems, and motion-aware technologies, their products appeal to a creatively driven customer base of commercial users, nonprofit users, and personal users. Located in Shenzhen, China—a hotbed of technological resources, research, development, and innovation—DJI has quickly evolved into an international business. Since opening in 2006, DJI has expanded to the United States, Germany, the Netherlands, Japan, South Korea, Bejing, Shanghai, and Japan. Their other consumer lines offer different designs, such as the mini drones of the Spark Series, the professional-grade aerial imaging of the Phantom Series, and the stabilized video features of the Osmo Series. The Mavic Pro is the original in the Mavic series, making it the successor of Mavic Pro Platinum, Mavic Air, and Mavic 2. Being the oldest in the series, the Mavic Pro offers the second most affordable price tag, behind the Mavic Air. However, the Mavic Air sacrifices image quality and the supreme stabilization properties of the Mavic Pro. The newest models—think of the Mavic 2 Pro and Mavic 2 Zoom—are the most expensive within the line. Released as recently as July of 2018, they boast the most cutting-edge drone technologies. For instance, a 360-degree obstacle detection feature is on both of the new models, which can be a useful upgrade for professional aerial photographers. ​For a sleek, contemporary model with quality image and video capturing features at an affordable price, the DJI Mavic Pro is an excellent contender. Unlike drones of the past, the DJI Mavic pro is user-friendly and renders impressive results despite its modest size. Newer models in DJI’s Mavic range deliver different, and in some cases improved, technologies, but the Mavic Pro is a solid, reliable option that will please most users.